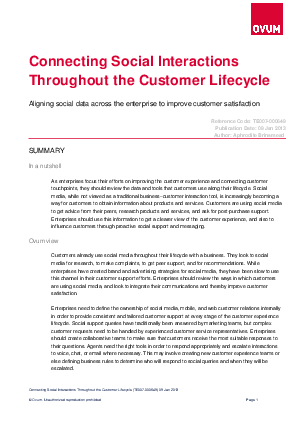 As enterprises focus their efforts on improving the customer experience and connecting customer touchpoints, they should review the data and tools that customers use along their lifecycle. Social media, while not viewed as a traditional business–customer interaction tool, is increasingly becoming away for customers to obtain information about products and services. Customers are using social media to get advice from their peers, research products and services, and ask for postpurchase support. Enterprises should use this information to get a clearer view of the customer experience, and also to influence customers through proactive social support and messaging. To learn more download this Ovum Research Document. Compliments of Oracle.